zodiac : n. 1.a. A band of the celestial sphere, extending about eight degrees to either side of the ecliptic (the sun’s path), that represents the path of the principal planets, the moon and the sun. b. In astrology, this band divided into 12 equal parts called signs, each 30 degrees wide, bearing the name of a constellation for which it was originally named. 2. 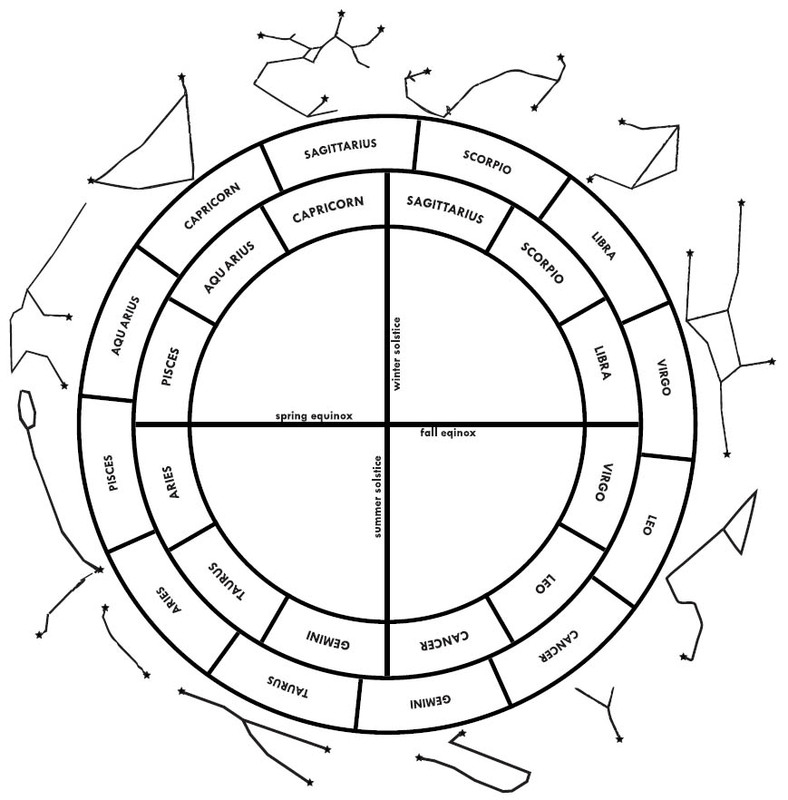 A diagram or figure representing the zodiac. Webster’s New Collegiate Dictionary (1949) adds other definitions of interest: 2. Rare – a circuit; zone; also, a girdle. Zodiacal light: A nebulous light seen in the West after twilight and in the East before dawn. The 1991 English translation of J. E. Cirlot’s 1971 A Dictionary of Symbols states that the word ‘zodiac’ is derived from the words zoe (life) and diakos (wheel). In January 2011, astronomer Parke Kunkle stated that the earth and the sun were constantly moving and that the changes in the earth’s alignment inevitably caused changes in the astrological Zodiac. Media reports quickly announced that the Zodiac had changed and therefore changed the astrological signs of everyone on the planet. The news caused a frenzy of confusion and criticism until Kunkle and others accurately noted, “This is not new news… Astronomers have known about this since about 130 B.C.” Media reports then stated that the confusion was caused by the differences between Eastern and Western versions of astrology. The sidereal Zodiac used in Eastern astrology originally included a thirteen sign Ophiuchus the snake holder but this sign was eventually discarded by the Ancient Babylonians who preferred a Zodiac with 12 houses. 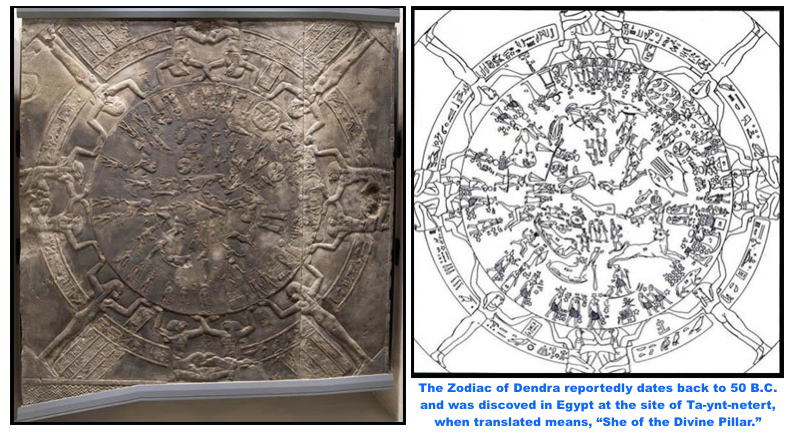 The Zodiac was also adapted and changed by many cultures and societies over the centuries. 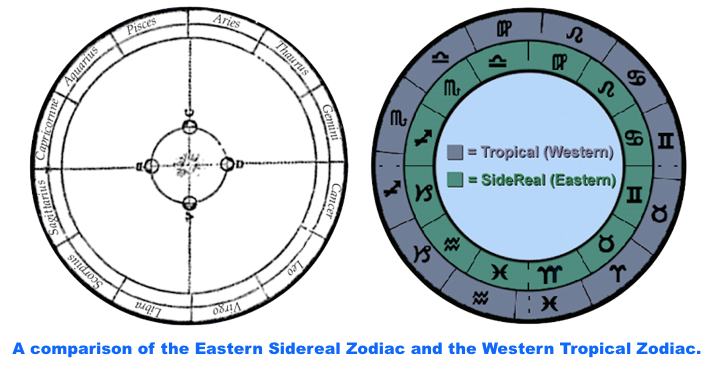 The website LunarPlanner.com features an informative article titled The Tropical and Sidereal Zodiaks & The Cycle of Earth’s Precessional Cross which includes an animated illustration of the astrological Zodiac and the crossed-circle. Some skeptics have argued that the name “Zodiac” does not usually appear with the crossed-circle symbol in astrology, however, the name AND the symbol are synonymous and have the same meaning. In astrology, the name Zodiac rarely appears with the crossed-circle symbol precisely because a crossed-circle symbol represents the name “Zodiac.” The Zodiac killer never used the name and the symbol together; in fact, in his first letters, the killer did not use the name Zodiac at all. 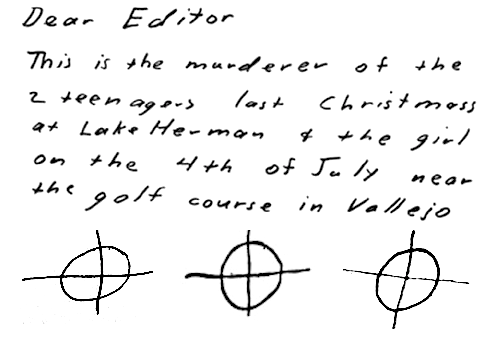 Instead, the killer signed these messages with a crossed-circle symbol, proving that the name and symbol were interchangable and had the same meaning to him as well. Some skeptics also argue that they have not seen the crossed-circle symbol used to represent the astrological Zodiac, however, the crossed-circle symbol has been used in this fashion for centuries (as demonstrated by the many illustrations provided here). 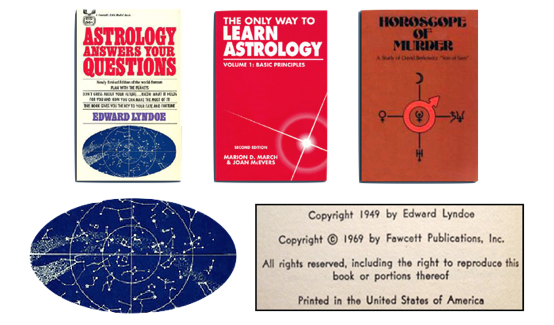 The 1969 edition of the book Astrology Answers Your Questions featured a crossed-circle symbol on the cover, as did the cover of the 1997 book The Only Way To Learn Astrology. The crossed circle also appeared on the cover of a book about the horoscope as it related to confessed serial killer David Berkowitz aka Son of Sam. 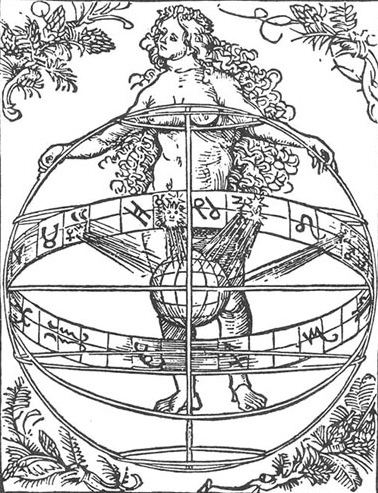 Astrology uses the crossed-circle to denote the four seasons, the four points on a compass, and the earth. However, the crossed-circle also serves as the basis for all astrological analysis. 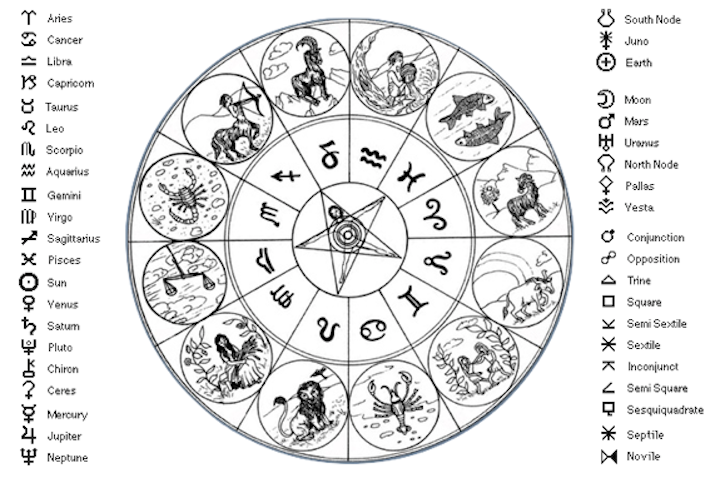 The natural or flat wheel is a chart from which the astrologer is said to “read” the horoscope of a chosen individual. 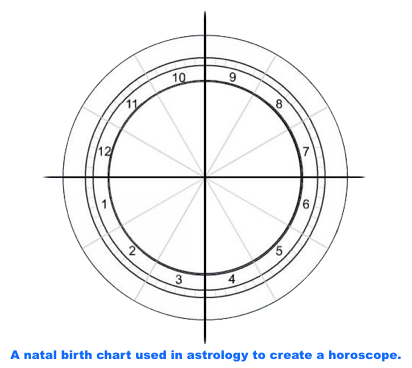 In order to accurately interpret the chart, the astrologer must have the date, time and place of the subject’s birth. This information is then interpreted using various methods, and applied to the chart of the zodiac. The resulting horoscope is defined as a map or diagram of the heavens erected to determine the potentials, characteristics, or future of a the person in question. The chart, or wheel, is constructed in stages. First, a circle is drawn. Then, the circle– representing the earth– is divided by what are called meridian and horizon lines. The horizontal axis of the chart is called the equator, or horizon, which divides the chart into day and night sections, designating day planets and night planets. The vertical axis, or meridian, divides the chart into an eastern half and a western half. These two sections are formed when the chart is divided along the noon to midnight axis. With this division, an astrologer can identify rising planets, which are those in the eastern half of the chart in the time from midnight to noon, and setting planets, in the western half of the chart in the time from noon to midnight. This division is referred to as dividing the houses by quality. The meridian and horizon lines also correspond to the cusp of each sign which represent the four Cardinal points of a compass. These are called Cardinal signs because they govern the change of season: ARIES = East, Spring / CANCER= North, Summer / LIBRA = West, Fall / CAPRICORN = South, Winter. When the wheel chart is divided by the seasons or direction, the circle is effectively divided into four equal parts of 90 degrees each, or, a crossed-circle, and is often depicted as such. The first house of the zodiac is Aries, the rising or Ascendant sign. The border line between the end of the twelfth house of Pisces and this first house is called the first house cusp. As the starting point of the Zodiac, this point, or cusp, is designated at zero degrees. The sign of Aries spans thirty degrees, and is measured from zero to twenty-nine degrees. The remaining eleven signs are similarly measured from the end of the first house onward, counterclockwise. RIGHT ASCENSION: The azimuthal angle at which the hour circle of a celestial object is located. The rotation axis taken as the direction of the celestial pole. Right ascension is usually measured in units of time (hours, minutes, and seconds), with one hour of time approximately equal to 15° of arc (360°/24 hours=15°/hour). Because the time for the Earth to complete a rotation relative to the “fixed” stars is slightly shorter than the time to complete a rotation relative to the Sun (a sidereal day is 23 h 56 m 4.1 s, whereas a solar day is 24 hours), one hour of right ascension is actually equal to 360°/23.9344…hours= /h. Right ascension is standard method used in navigations, physics, astrology, astronomy, and other disciplines. The explanation below was provided by the website The Astrophysics Spectator. Positions on the sky are measured in terms of right ascension (RA or α) and declination (dec. or δ). These correspond to longitude and latitude on Earth. The declination is measured in degrees relative to the celestial equator, which is the projection of Earth’s equator onto the sky. The declination of the equator is 0°, the declination of the north pole is 90°, and the declination of the south pole is −90°. 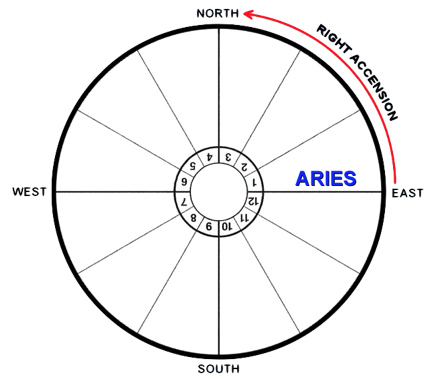 The right ascension is defined in units of time, with 0 hour at the first point of Aries, and the value of the right ascension at the zenith increasing as time passes. A full circle of the equator corresponds to 24 hours. Right ascension was defined to make finding objects with a telescope easier: the right ascension at the zenith changes by one hour in one hour of sidereal time. Aspect is the geometric relationship between two planets in the horoscope chart. Aspects are important in analyzing a horoscope because they give the combined effect of the functions of the two planets involved. The major aspects between the planets are the conjunction, semi-sextile, sextile, square, trine, square, Quincuncx and opposition. The semi-sextile, sextile, trine and conjunction are said to be good or favorable whereas the square, opposition and quincunx are taken to be not favorable.Aspects are the vital factors in the formation of ones character. The Conjunction – The conjunction is formed when two planets are at approximately the same degree of the same sign or at an orb of not more than 8 degrees. In a conjunction, the energies of the two planets are combined, and the result is often a strengthening of both. Connjuction of Lords of 1, 4, 7 and 10th houses produces good effects. Conjunction of the trine Lords (5th and 9th houses) are always good irrespective of their location. A Moon-Venus conjunction is beneficial whereas a Saturn- Mars conjunction is said to be stressful. The Semi-Sextile – This aspect is formed when two planets are 30 degrees apart with an orb of two degrees in either direction. This aspect is reckoned to be mildly favorable with the planets working well together. The Sextile – Sextiles occur when two planets are approximately 60 degrees apart. This is the aspect of opportunity. It is the 3rd and the 11th house Hindu aspect. Initiatives can be taken during this aspect and it reinforces the weak points in life. It is a very beign aspect indicative of talent, confidence and popularity. The Square – Squares occur when two planets are approximately 90 degrees apart. It is the 4th and the 10th house Hindu aspect. Square causes the friction and the hurdles that help us to grow and become productive. This is the most critical amd conflicting aspect. It gives disturbed, prejudiced or adverse conditions and circumstances accompanying it. It is a separative aspect and it turns the tide of fortune. The Trine – A trine occurs when two planets are approximately 120 degrees apart. It is the 5th and the 9th house Hindu aspect. Trines bring about ease and comfort.This is a fortunate aspect for harmony, peace and does much to improve adverse aspects. When occuring between Sun and Moon it is more fortunate than any other aspect. The Opposition – The opposition occurs when two planets are about 180 degrees apart. It is the 7th house Hindu aspect. As the name implies, opposition are obstacles that must be resolved. This is a malefic aspect of perfect balance. It includes confrontation and partnership. It indicates change of circumstances. Oppositions can manifest as mood swings. Similar to aspects are nodes, which designate either of the two points where the orbit of a planets intersects the ecliptic, or where the orbit of a satellite intersects the plane of the orbit of its primary. The node passed as the body goes north is called the ascending node, and that passed going south, the descending node. These ascending and descending nodes are also referred to, respectively, as The Dragon’s Head and The Dragon’s Tail. The various symbols for the planets, their relationships, angles and signs are then applied to the flat wheel in order to read a horoscope. The astrologer uses the symbols to construct a formula which often resembles a mathematical equation. 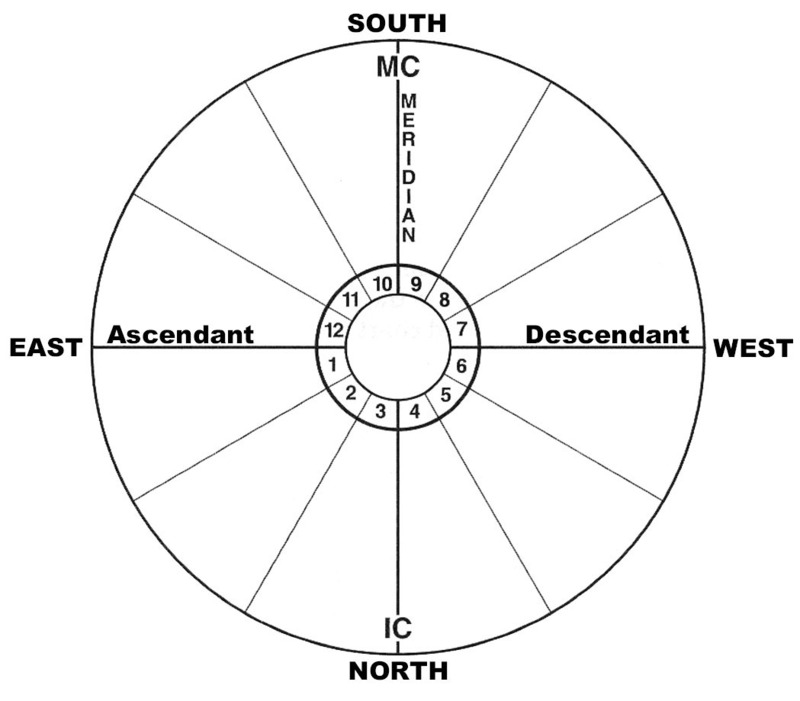 In summary, the astrological flat or natural wheel has the following characteristics and elements 1) the name “the Zodiac” 2) the crossed circle, which serves several purposes: a) a compass designating North, East, West and South b) a horizontal axis, or equator/horizon line, dividing the wheel into day and night sections, and, a vertical axis, or meridian line, which divides the wheel into Easter and Western halves. 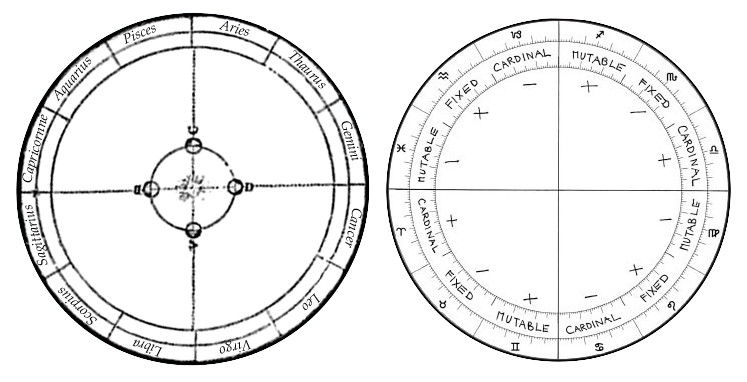 These are used to determine the times of planetary position c) a cross designating the four Cardinal points of a compass and the four seasons 4) angles measured by degrees 5) symbols representing these angles, as well as the planets, and the signs of the Zodiac. The Zodiac mailed a Halloween card with featured his own additions and illustrations, using the words “SLAVES” and “PARADICE” to form a cross. In each of the four quadrants, the Zodiac added the phrases, “BY FIRE, BY GUN, BY KNIFE” and “BY ROPE.” The meaning of the Zodiac’s message remains unknown but it is possible that he was alluding to the four elements of the astrological Zodiac. The Zodiac also wrote the phrase “sorry no cipher” in the form of a cross as if to reinforce his intended interpretation. Even the stamp depicted a view of the earth from the moon as further confirmation. The Zodiac claimed that his infamous “Mt. 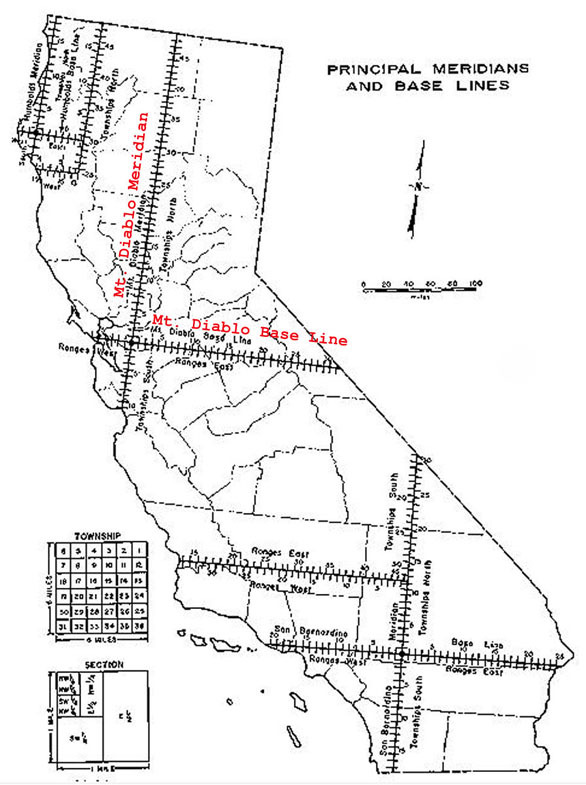 Diablo” map and code would help authorities locate a bomb, and the killer suggested that the use of radians and inches would assist in the search. A radian is an angle used in mathematics, valued at 57.3 degrees. 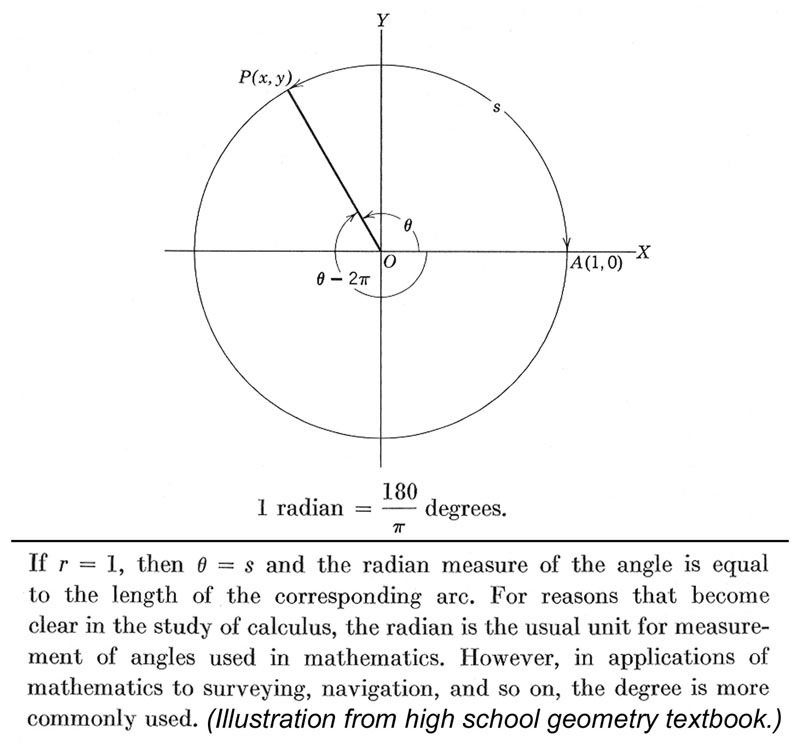 A radian is defined as: “The radian is a unit of angular measure defined such that an angle of one radian subtended from the center of a unit circle produces an arc with arc length 1.” (Source: Weisstein, Eric W. “Radian.”From MathWorld–A Wolfram Web Resource.) A radian is a geometric angle, meaning that anyone who attempted to decipher the Zodiac’s code and apply that solution to the map in question would be required to use geometric angles to find the location allegedly specified by the Zodiac. 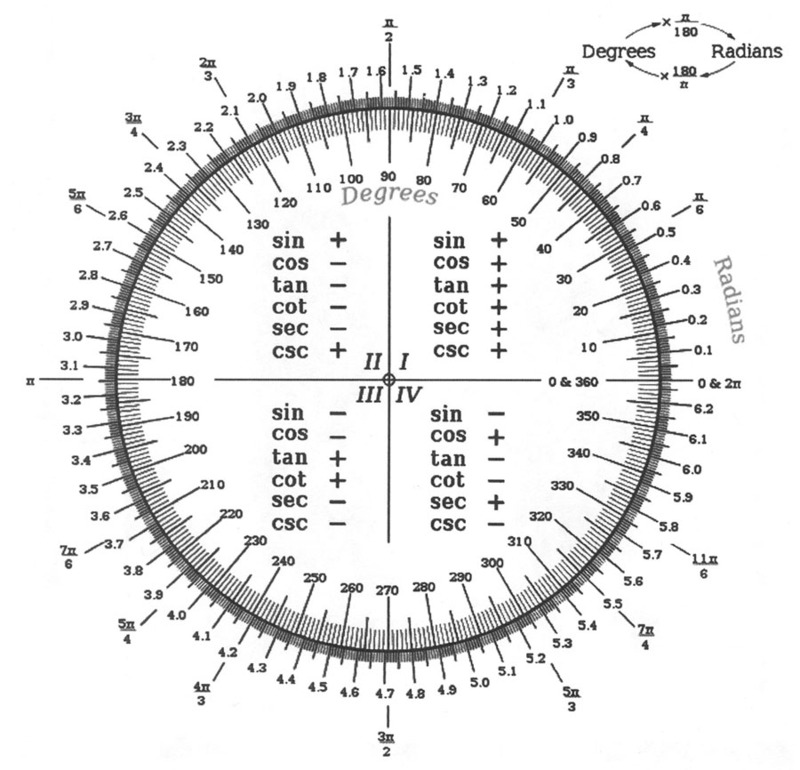 Radians are not simply measured in whole units; any number of degrees can be converted to radians. For example, 38 degrees is equal to 0.663225 radians, 79 degrees is equal to 1.37881, and 165 degrees is equal to 2.87979 radians. The Zodiac’s instructions specifically referred to “radians,” indicating that the solution to his “Mt. Diablo code” required radians, meaning, more than one radian, or, any number of degrees measured in radians. The Zodiac’s Mt. 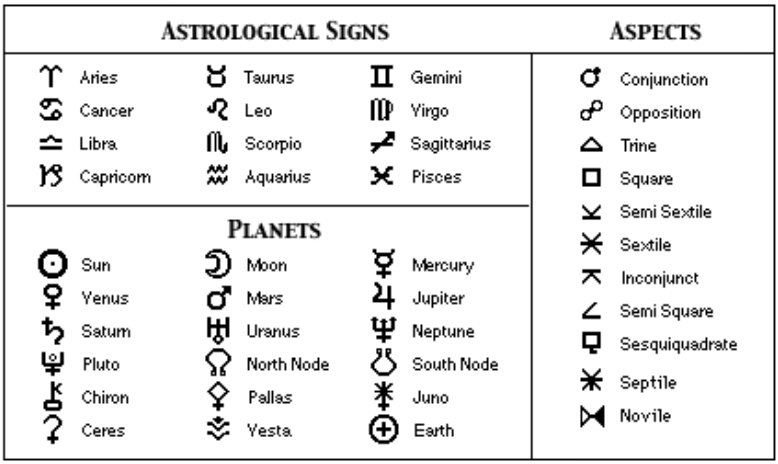 Diablo code featured several symbols which are used in astrology. The code contained one symbol which resembled the astrological symbol for the sign of Aries, although the Zodiac’s symbol is upside-down. 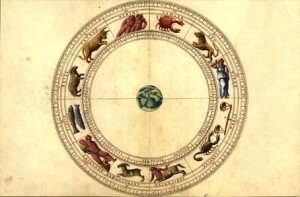 In most illustrations, the astrological Zodiac is depicted as seen from space. When the astrological Zodiac is depicted as seen from the perspective of the earth, the house of Aries moves and the symbol often appears upside-down in such illustrations. Other symbols found in the Zodiac’s code are used in astrology to denote geometric angles and to identify a specific location. The Zodiac’s code was purportedly intended to assist in identifying a specific location. The killer provided a map which featured a crossed-circle symbol on the peak of Mt. Diablo. The cross was placed over the mountain in such a manner that the four points approximated the four points of a compass, and, at each of these positions, the Zodiac had written a number; North = 0, East = 3, South = 6, and West = 9. To the right of the zero were the following words: “is to be set to Mag. N.” This was an obvious reference to Magnetic North, defined as the direction to which the north-seeking pole of a magnetic compass needle points. Magnetic north is defined by the Merriam-Webster Dictionary as “the northerly direction in the earth’s magnetic field indicated by the north-seeking pole of a compass needle.” The magnetic force of the earth pulls the compass needle out of alignment with true north. The difference between true north and magnetic north is the angle of declination, which varies according to the location of a compass on the earth. The angle of declination from Mt. Diablo at the time the Zodiac sent his map was estimated between 16.5 and 17 degrees east of true North. The declination is occasionally adjusted as the magnetic force of the earth that causes the variation shifts and changes with the passage of time. Zodiac provided all the necessary tools if he was actually attempting to give authorities the material required to locate a specific geographic location. The map, the Magnetic North annotation, and the instructions regarding radians and inches are all appropriate for the Zodiac’s stated task, and the use of Mt. Diablo as a geographic marker and starting point suggests that the Zodiac knew exactly what he was doing. The Zodiac’s Mt. 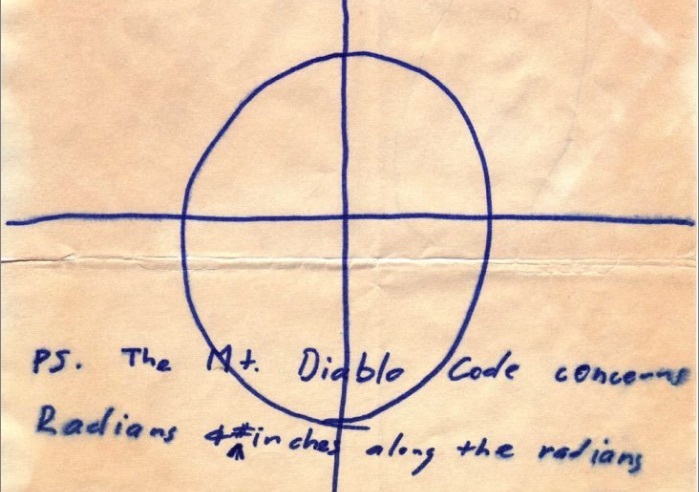 Diablo code, map and hints appeared to reference geometric angles, radians and inches, and more in order to identify a specific location. 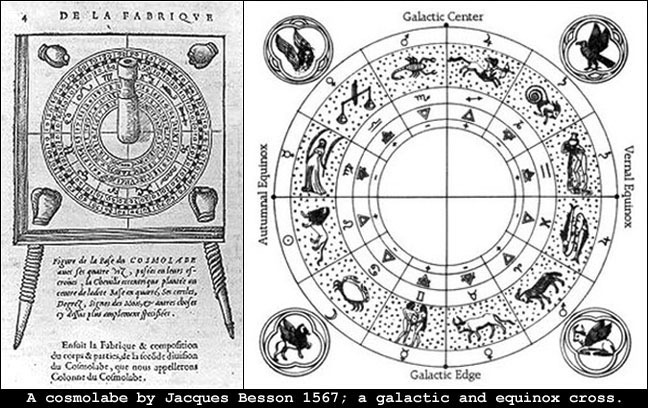 The killer’s code contained symbols used in astrology to denote geometric angles, the sign of Aries, and the sun. The key components of the astrological Zodiac are the crossed-circle, the name Zodiac, geometric angles, the sun, and the use of Right Ascension which begins at the house of Aries in order to identify a specific location. 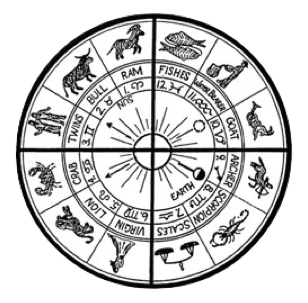 The available evidence indicates that the self-described “Zodiac” may have been inspired by the astrological “Zodiac” when choosing his adopted name and symbol.